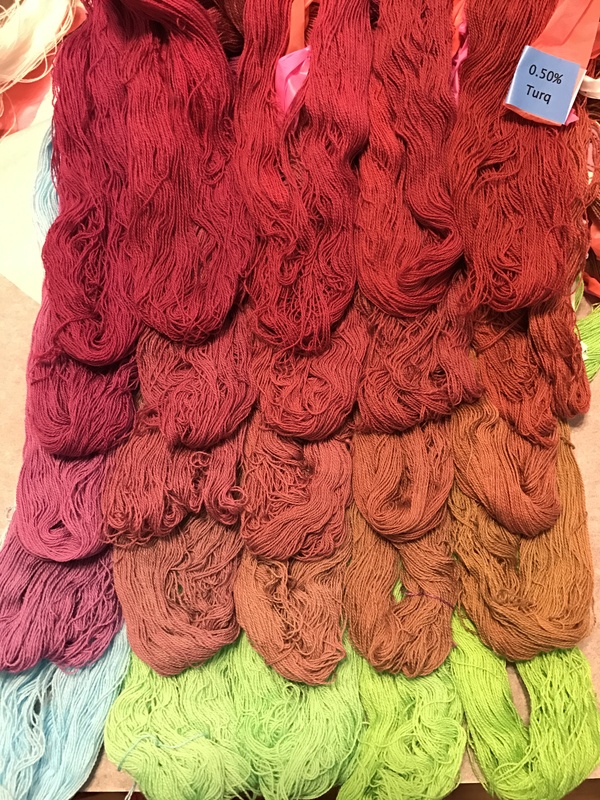 Because I think a set of color-mixing samples in MX dyes on cotton would be of value to the fiber community, I’ve been pondering over how best to make my samples available. The problem is that digital colors are terribly unreliable: both cameras and monitors are very bad at reproducing color accurately, so what you see on your screen may be radically different from what I see in real life. 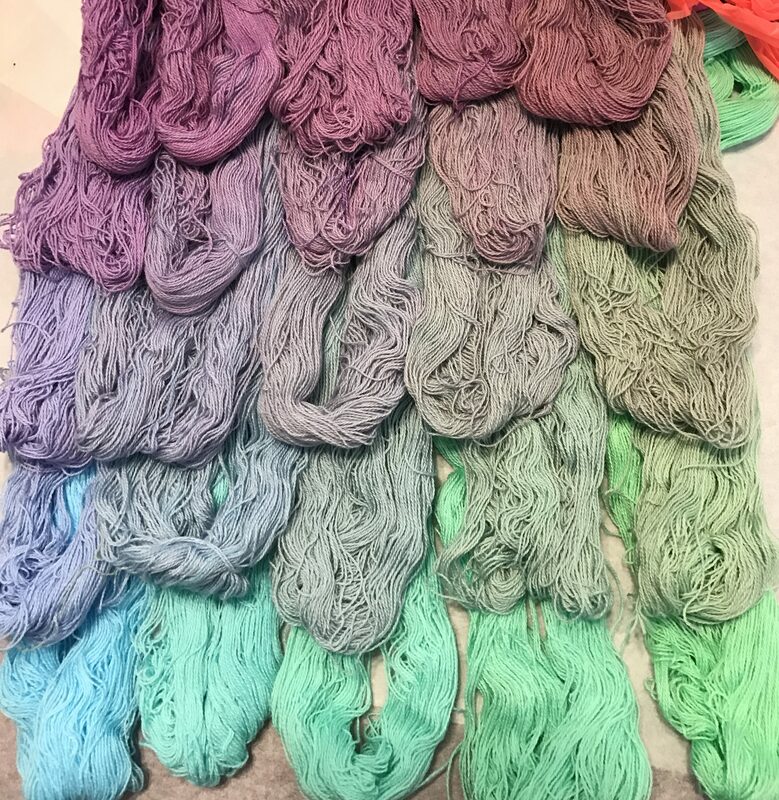 While they look very different in the two photos, I can assure you that the skeins in the bottom left corner of each photo are exactly the same color in real life, and closer to the color in the top photo than the bottom one. What is happening is that the iPhone is adjusting colors relative to each other, so the presence of the intense dark reds makes it “decide” that the turquoise is lighter and yellower than it is. Similarly, one display may show a very different color from another display. I don’t have photos to demonstrate, but if you display the same photo on two smartphones/tablets/monitors, you’ll quickly see the difference. So then how does one communicate an exact color with precision? Digitally, you can’t. But what I can do is provide a reference to an accurately printed color, that the reader can then look up to see the exact shade in real life. But what color references can I use? The two most common ones I know of are the Pantone color guides and the Munsell color system. The trouble is that both systems are very expensive – $175 for the Pantone formula guide and $1,000+ for the Munsell color books. So I did some more digging and discovered a marvelous book. Paul Centore has produced a book titled Controlling Colour with the Munsell System that is spectrophotometrically matched to the correct colors, so it is just as accurate as the $1000 book but costs only $75. (It’s available on Amazon.) That is still a bit pricey, but much cheaper than the other options, and very inexpensive indeed for that level of precision. The Munsell color system breaks down color along three axes: Hue (position on the color wheel), Value (gradation from light to dark), and Chroma (saturation – bright vs. dull). The Munsell colors are typically printed with a different page for each hue, with the value gradations in rows (1-9 from bottom to top) and the saturation in columns (/2 through /20 from left to right). This allows accurate identification of any color. Of course some colors may fall in between, in which case they are written with in-between numbers; for example, a color that appears to be between 5/12 and 5/14 would be written 5/13. But with 1800 colors there is usually a good color match to be found. I am inclined towards the Munsell system over the Pantone Formula Guide because the Munsell system is designed to cover the space of possible colors in a systematic fashion, so it is easy to express in-between colors by interpolating between the numbers. The Pantone Formula Guide has a different purpose: to give printers exact guides to follow to reproduce a certain color. It does cover a wide color gamut but there is no provision for in-between colors, at least not that I know of. That makes the Munsell system superior for my purposes. My plan is to match each sample to a shade in the Munsell system, write that number on the card, and then take photos with the best color accuracy that I can get, so at least the samples start out with relatively matched colors. Thus, people can get a general sense of how the shades shift, with references to the exact color. 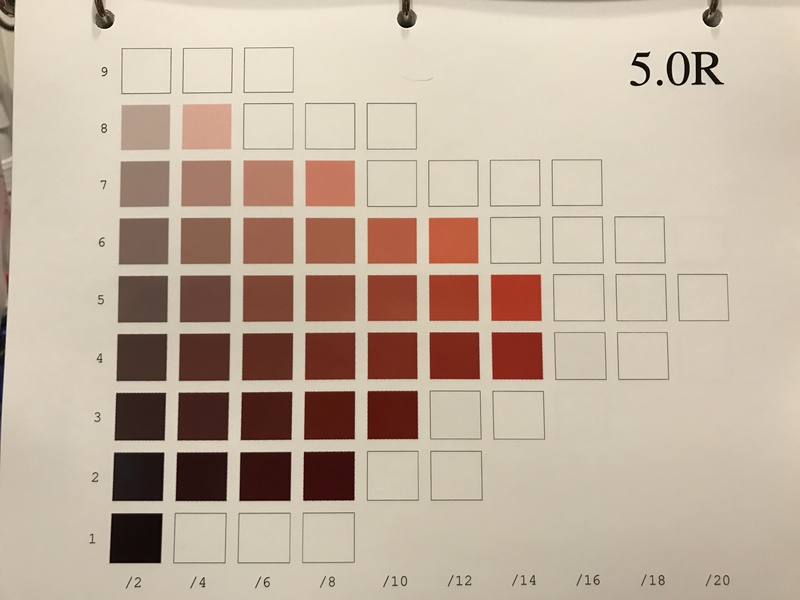 If I get really obsessive, I may create a chart that maps each shade in the Munsell color book to a shade in my dye samples (if a match exists, of course), so I don’t have to flip through all the samples to find a matching color. Why am I doing all this? Because I think it will make it easier for novice dyers to understand and do their own color mixing. Hopefully this will make dyeing your own color palette much more accessible, as it would be possible to get a formula for a color without having to dye 1000 samples yourself. Of course, all that depends on my having the time and energy to analyze, label, and post photos of all 1500 samples, so this may or may not happen. But that’s what I hope to do. Meanwhile, if you want a wide selection of colors without having to dye your own, may I recommend these folks? 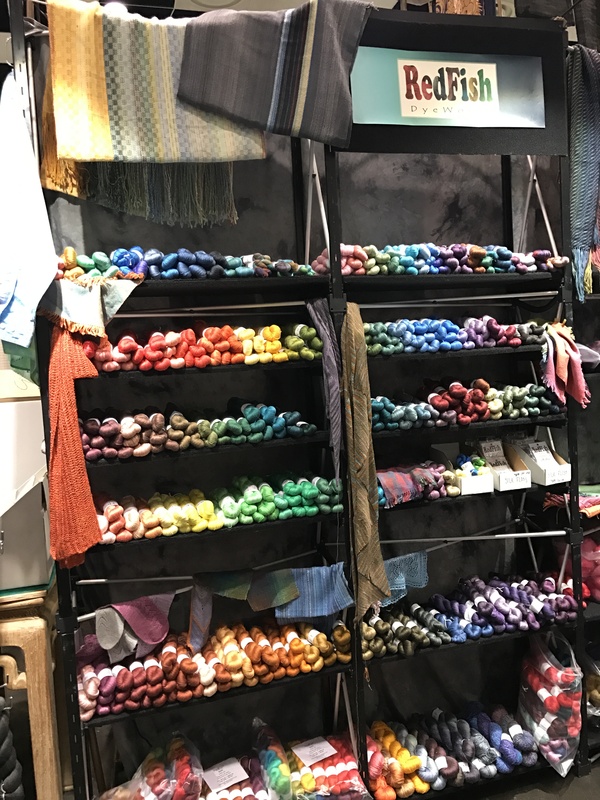 As you can see, Redfish Dyeworks has an incredible assortment of colors – mostly in silk but also in other protein fibers – available in small skeins. That makes it practical to use lots of colors without breaking your budget. And because the color palette is so large, it’s easy to do color gradations, too. For the interested, they’re at www.redfishdyeworks.com .